· Eva Zeisel, one of the foremost designers of the 20th century. The Museum's annual gala will begin with a cocktail reception and a silent auction at 6:30 p.m., followed by the awards ceremony, dinner, and dancing at 7:45 p.m. at the Mandarin Oriental Hotel at 80 Columbus Circle at 60th street. The Museum’s Visionaries! gala is the Museum’s most important annual fundraiser supporting the Museum’s exhibitions and educational programs. Each year, more than 700 guests including artists, designers and noted corporate and civic leaders attend the event. Event co-chairs for this year’s gala are Susanne Durst, Suzanne Elizabeth Murphy, Jean Richards and Miles Young. more information, please call Stephanie Lang, 212.299.7729. 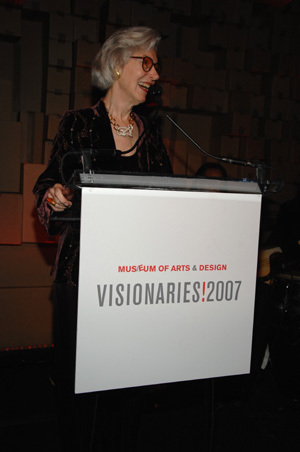 Barbara Tober joined the Museum’s Board in 1988 and was named Chairman in 1994. Her foundation has twice funded Quilts Across America, an educational arts project for children nationwide sponsored by the Museum. Tober is president of Acronym, Inc., a venture capital firm that invests in art-related projects, including The Guild Publishing Company, Inc., publishers of The Sourcebook for Architectural and Interior Art. Prior to her involvement in the art world, Tober spent over four decades in corporate advertising and magazine publishing, most notably at Condé Nast Publications where she was editor-in-chief of Brides magazine for nearly 30 years. Internationally known for her organic modernist ceramic works, Eva Zeisel is truly one of the foremost designers of the twentieth century. With over 60 years in the field, Ms. Zeisel is one of the best-selling tableware designers of all time and her highly-collectable works have literally changed the face of modern design in the 20th century. The first designer in America to produce an all white service, Zeisel has received many honors for her outstanding achievements, beginning with her selection in 1942 by the Museum of Modern Art in New York, to design a line of fine porcelain dinnerware for the Castleton China Company of Pennsylvania. The designs were not completed and produced until 1945, due to wartime restriction, but were presented at a one-woman show at MoMA in 1947. Shelly Lazarus has been working for more than three decades at Ogilvy & Mather Worldwide and is currently Chairman of the worldwide company. She started at Ogilvy at a time when the agency’s legendary founder David Ogilvy still walked the halls, and personally preached that the purpose of advertising was to build great brands. Under her leadership, that essential mission has remained the centerpiece of the company’s philosophy, extending across regions and marketing disciplines, and attracting some of the world’s largest and most respected brands, including American Express, BP, Coca-Cola, IBM, Motorola and Unilever, among many others. Advertising Women of New York selected Lazarus as its Woman of the Year in 1994. She was honored by Women in Communications with their Matrix Award in 1995, was named Business Woman of the Year by the New York City Partnership in 1996, and Woman of the Year in 2002 by the Direct Marketing Association (DMA). She has appeared in Fortune magazine’s annual ranking of America’s 50 Most Powerful Women in Business for ten years following the list’s inception in 1998. She was the first woman to receive Columbia Business School’s Distinguished Leader in Business Award as well as the first woman to receive the Advertising Educational Foundation’s Lifetime Achievement Award. MAD’s Visionaries! awards annually recognize leading artists and designers and exceptional, culturally engaged corporate executives who have advanced the fields of art, craft and design. Their achievements are at the foundation of the Museum’s mission to foster an enthusiastic appreciation of contemporary craft, decorative arts, and design as well as to the related fields of fashion, architecture, interior design, and technology. Visionaries! honorees are recognized for contributions to their respective fields and for their work in establishing new standards of excellence. · Business leaders such as Tiffany design director John Loring; Neiman Marcus president and CEO Burton M. Tansky; Paul R. Charron of Liz Claiborne, Inc.; entertaining guru Martha Stewart; and Claudio Luti, Chairman of Kartell.